As Minister of Finance may have been part of the Tibet Work Leading Group. Described as an “important political aide” of Xi Jinping. Education: Studied in the Finance Department of Renmin University (1978 – 1982), in (West) Germany from 1987 to 1989 and for an on-the-job doctorate whilst at the Ministry of Finance. Career: For much of his career worked at the Ministry of Finance but had periods of service in Liaoning and Hunan Provinces, at the Central Party School and as Li Keqiang’s Chief of Staff. Prospects: Member of 19th CCP Central Committee. Served as Minister of Finance in 2016 – 2018 when China suddenly replaced his well-known predecessor Lou Jiwei. Relevance to Tibet: May have been part of the reconstituted Tibet Work Leading Group? 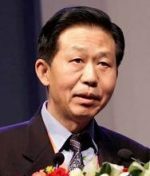 Xiao Jie’s predecessor as Minister of Finance, Lou Jiwei – a familiar and respected face internationally – was seen as an outspoken and reformist figure, according to the BBC. Xiao Jie is a long-term advocate for tax reform who smokes the cheapest brand of cigarette so that no-one can bribe him with a more expensive variety. This entry was posted in Profiles and tagged China, Chinese Communist Party, Finance, Lou Jiwei, Tibet, Tibet Work Leading Group. Bookmark the permalink.